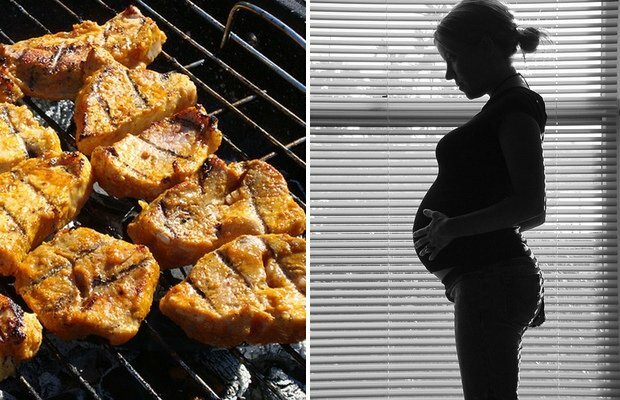 Is Eating Barbecue Bad for Pregnant Women? New research shows that the popular smoked and grilled meat may cause fetal development issues. A study published in the journal Nutrition this month found that women who ate barbecued meat during their pregnancy had underweight babies. Photographs courtesy of Flickr users sebilden and mahalie. The list of what pregnant women shouldn’t eat and drink is already depressingly long. But here’s one more beloved comfort food to add to the list: barbecue. Consuming barbecued meat, which typically means meat that’s been grilled from smoking wood, may cause issues with fetal development, according to a study published in this month’s Nutrition journal. Researchers at a medical school in Poland monitored 432 pregnant women throughout their entire pregnancy, interviewing them about their dietary habits, medical and reproductive history, and in particular, the frequency of grilled, broiled, fried, or smoked meat consumption during each trimester. They found that women who ate barbecued meat in the third trimester of pregnancy gave birth to babies who weighed on average six ounces less than the mean weight of 7.62 pounds. In addition, the barbecue consumers had babies who were shorter in length by 0.82 centimeters and had a smaller head circumference. But why would fatty barbecue cause a weight deficit? It has to do with polycyclic aromatic hydrocarbons, which are widely present in the environment and are classified as “probably carcinogenic” to humans. When the outer surface of meat comes in contact with the grilling fire, it causes the meat’s fats and the charcoal smoke to produce high amounts of PAH. Once absorbed, researchers explained in the study, PAH is transferred from the placenta to the fetus. “Developing fetuses and infants are significantly more sensitive to environmental toxicants than adults,” researchers wrote in the study. Much of our exposure to PAH comes from our diet–70 to 90 percent, to be exact. Airborne exposure, usually generated by the burning of oil, gas, car exhaust, and tobacco smoke, can also prove harmful. However, airborne PAH exposure was much lower among pregnant women who ate barbecue, since a majority of them lived in city areas with low pollution levels. Still, the combined exposure of both airborne and consumed PAHs produced a total birth weight deficit of 7.55 ounces. Researchers noted that while exposure to PAH certainly presents a new reproductive health hazard, more studies are needed to explore the “impact of dietary sources of PAH exposure in pregnancy.” They cite the fact that other lifestyle factors not controlled in the study may have contributed to the babies’ low birth weights.